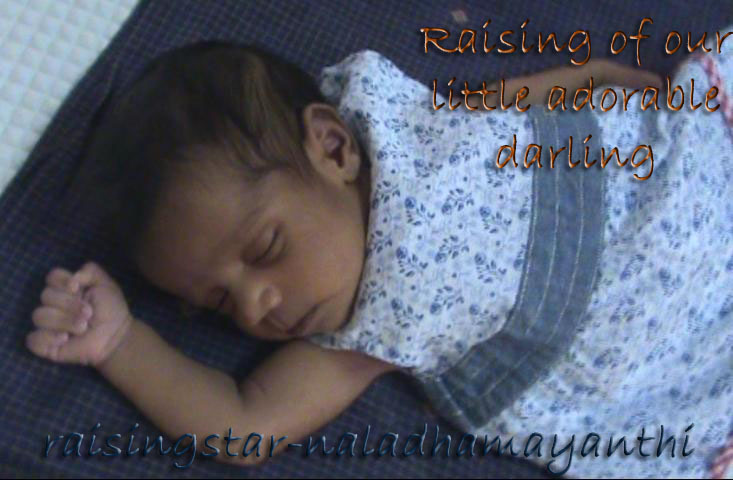 Raising of our little adorable darling: It is called Whining? I think kids started knowing the magic of Whining in early years and there in no one needed to tell them what it is. They know how to change a "No" to "Yes". Thamizhini is no different and these days what ever she wants, she asks with a crying whining voice. She is not really ready to understand the difference between asking in a good / regular mood and crying mood. We are very sure that we are not making her to whine for everything. We pay full attention to her before she starts whining and sometimes she might not understand what the word "No" means and why we say so. However, we make our house child safe, still some of dangerous things would be reachable for them, like electric plug points, shoes, back side of TV, fridge and mosquito killer bats. I could still remember that she was not at all touching those things, even if she tries, the one word "NO" was enough for her to control. But later if any one at home allow her to do that same naughty thing, then she will not be ready to listen others. And that is where whining starts, because If me or Nalin yell at her for her "Don't touch" things. This is how going on these days, One say No, the other says Yes and Thamizhini takes advantage of her choices.